Now I’ve passed my test, I can’t stop itching to get back on a bike. Every day I take the bus/tube to work, I longingly look at bikes going by wishing I had my own. But what bike do I get? I’m very tempted by the Honda CBF500, it’s what I learnt on, what I know. It’s a good bike, that seems to be universally well regarded. A city full of couriers on them can’t be wrong. I like the idea of ABS, as an extra precaution and help me while I continue to build up my experience. I will inevitably make mistakes, maybe the ABS could prevent some. The CBF’s are still quite new ish though, so not the cheapest second hand. Unless its ex-courier and has done intergalactic miles. 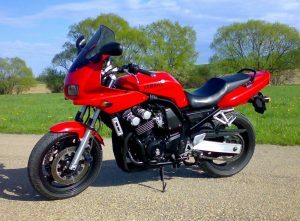 The older CB500’s are more reasonable, definitely fit a budget of about a £1000. But older and no ABS. 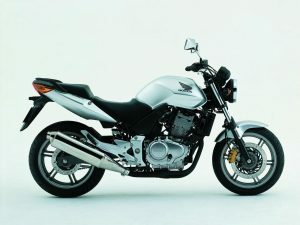 A good friend has recommended a Yamaha Fazer FZS600. Slightly bigger, more powerful and similar in price second hand. Insurance costs are about the same as the CBF500 too. Bit more edge, probably last me longer, I’ll less likely to out grow it so soon. But no ABS. The bikini fairing on the Fazer should afford a little more protection from elements on the motorway. But it’s also a worry, as I will inevitable drop my first bike and probably crack or scuff it.